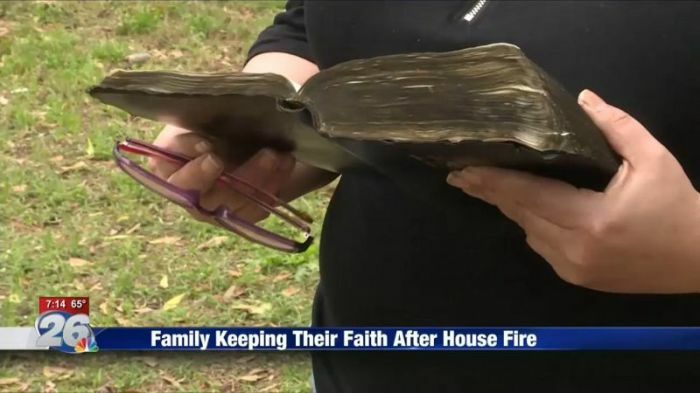 A South Carolina family is holding onto their Christian faith and sharing of the miraculous survival of their Bible in the midst of a fire that destroyed their home of 17 years. "It was completely unprotected. It was wide open. All the things around it were burned. Everything in there was destroyed, and there laid my Bible," Wendy Crawley told NBC 26. The family's home in North Augusta was completey destroyed and they lost their two dogs. Crawley said that she still hears the crackling of the fire in her mind more. The Bible sat on her nightstand as the fire, which firefighters say was caused by space heaters, raged. "It has some smoke damage and the pages were completely wet, but there's not a page destroyed," Crawley revealed. She noted that it is easy to have faith when things are going well in life, but harder when they are not. "It's easy to find God when things are going good, but when you step in the midst of all of that and find Him, it's comforting," she said. Speaking in a separate interview with WJBF NewsChannel 6, Crawley said that the loss of the dogs was hard to take. "We've had one for 15 years, and the other one was our son's service dog," she revealed. The servide dog, Sugar, was very important and special to her 10-year-old son, who has autism. "She was always there for him," the mother recalled. "If he couldn't figure out how to calm down, she would come and she would sit, and she would just lay on him and love on him." Crawley expressed thanks to the community that is supporting the family through various ways during the tough times. "God didn't start that fire, but He has certainly brought you through it," she said. There have been several miraculous stories of Bibles surviving fires in the U.S.
Jerry Bowyer, chief economist of Vident Financial and the editor of Affluent Christian Investor, shared in an op-ed in The Christian Post in September 2016 of a previously untold story regarding an unburned Bible at a 9/11 crash site. The story concerns the discovery of an "unburnt Bible among the smoldering and disintegrated wreckage" of Flight 93 near Shanksville, Pennsylvania. "This is real. But it's not just a 'miracle,' which is to say a wonder from God meant to inspire us by telling us that He was there that day. It is what the New Testament called a sémeion, a sign, which is to say a message to His people," Bowyer wrote. "I believe it is a message about what kind of age we are in, why we are in that kind of age, and what will happen to our nation if we (like the 'man of God' in chapter 14) are unfaithful to our calling," he added.